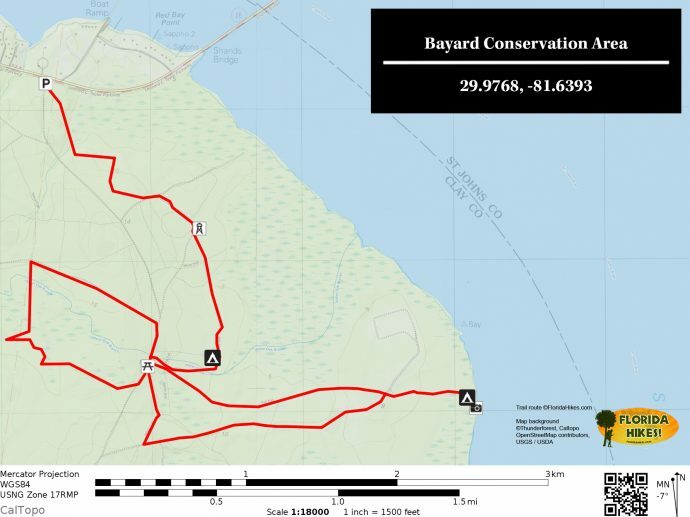 Bayard Conservation Area | Florida Hikes! 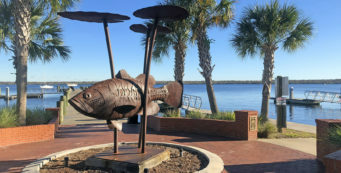 The St. Johns River runs broad and deep near Green Cove Springs, where Bayard Conservation Area preserves an untouched Florida riverfront, bottomland floodplain with dense stands of bald cypress, sweet gum, and red maples. More than 15 miles of trails wander through the John P. Hall Nature Preserve portion of the conservation area – the only part that’s off-limits to hunting – and by using the hiking trail and one of the equestrian trails, you can discover the beauty of the river for yourself. This is a prime destination for wildlife watching. An observation platform lets you view deer and wild turkey from above. Along the riverbank, green herons and little blue herons pick at minnows and shellfish in the shallows near a broad bed of blue flag iris. Two campsites provide the possibility of an overnight adventure. The blue-blazed trail is hiking only, although it crosses paths with a multi-use trail several times. Equestrian trails are marked with colored diamonds. The trails flood easily after a rain. Since we first hiked this trail, a golf course has been built along one edge of the preserve and is visible from the blue blazed trail. Since the current St. Johns Water Management District map only shows equestrian trails, the blue-blazed trail may not be well-maintained. From US 17 in Green Cove Springs, follow SR 16 east to the last turnoff on the right just before the St. Johns River Bridge. Starting at the John P. Hall Nature Preserve parking area, pass through the gate and make an immediate left onto the blue-blazed hiking trail. It follows the edge of the parking corral before turning right to head into the pine flatwoods, crossing a series of bog bridges before making the first of many crossings of the equestrian trails. It’s rough in places, with gatorbacks and standing water after a rain. After 0.3 mile, the trail turns sharply right past a catfaced pine stump. Merging onto a forest road at 0.7 mile, you see the white diamonds of the equestrian trail, and an observation platform, reached at 1 mile. It looks down over the forest, and is a good perch from which to watch for deer and woodpeckers. A short distance past the platform, the blue blazes leave the forest road at a sharp left turn—don’t miss it! Moments later, it rejoins a forest road, soon rejoined by the equestrian trail. Blue blazes and white diamonds lead the way. At 1.5 miles, the trails part ways at a fork, with blue blazes leading you left, eventually off the road and into the forest again on a narrow path to a campsite not far from a small creek. Skirting a floodplain forest, the trail parallels the stream to reach a junction at 1.8 miles with a red-blazed trail. Turn left, crossing the stream on a bridge. After a second bridge, you emerge at the “Cougar Trail” sign. Red diamonds marking an equestrian trail leads right and left. Turn right to visit the outdoor education center (which has a latrine and pitcher pump). 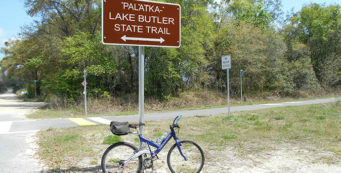 This is where two short trails begin—the 0.4 mile Cougar Trail (which you just walked a portion of) and the 0.6-mile Legacy Trail, both used by students who come here to learn about Florida’s outdoors. This is where the hiking trails end. 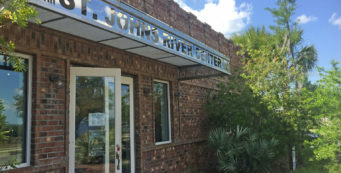 To get to the St. Johns River, you’ll need to walk down the equestrian trail. Follow the white diamond-blazed trail south from the kiosk to a T intersection with a grassy track. Turn left. Although the white blazes leave the track at 2.3 miles, you shouldn’t. 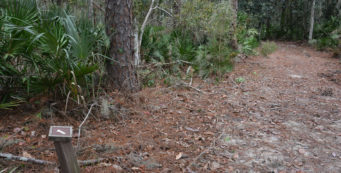 Walking on the well-defined road through the pine flatwoods, you reach the red diamond-blazed trail at 3.2 miles. Turn right and follow the blazes. 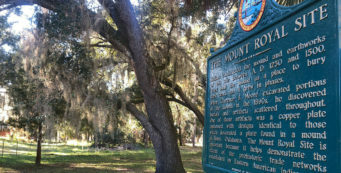 By 3.6 miles, you reach the Bayard Point campsite, a beauty spot on the St. Johns River with picnic tables and a fire ring. 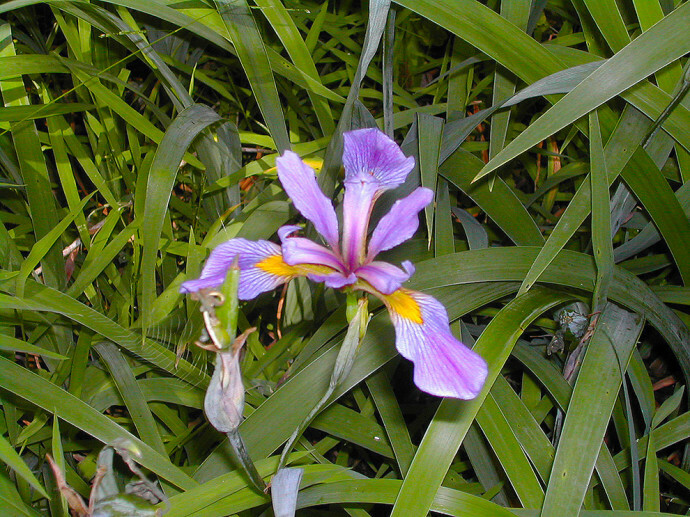 Blue flag irises sparkle under the tall cypresses. This is a spot where you’ll want to sit and savor the view a while. To return, follow the red diamonds down the forest road. Where the trail leaves the road, keep following the red diamond blazes. It will lead you into dense pine flatwoods past a bayhead, where some of the older pines have metal flashing embedded in their catfaces. At the fork, keep right. At the T intersection, turn right at the double blaze. After 5.1 miles, you return to the “Cougar Trail” sign near the outdoor classroom. To return to the parking area, another 1.9 miles up the trail, retrace the blue blazes north back through the first campsite. It’s very easy to lose the blazes, so keep alert! You reach the observation platform after 6 miles. Follow the blue blazes back through the pine flatwoods and over the bog bridges to complete the 7-mile hike.